Amritsar, the spiritual and religious capital of the state of Punjab, is a major pilgrimage spot for the Sikh community. There are several places to visit in Amritsar and sufficient things to do to ensure that you will never get bored during your visit! Home to a great number of Sikh temples and shrines, amongst which is the famous Golden Temple, Amritsar begs to be explored. 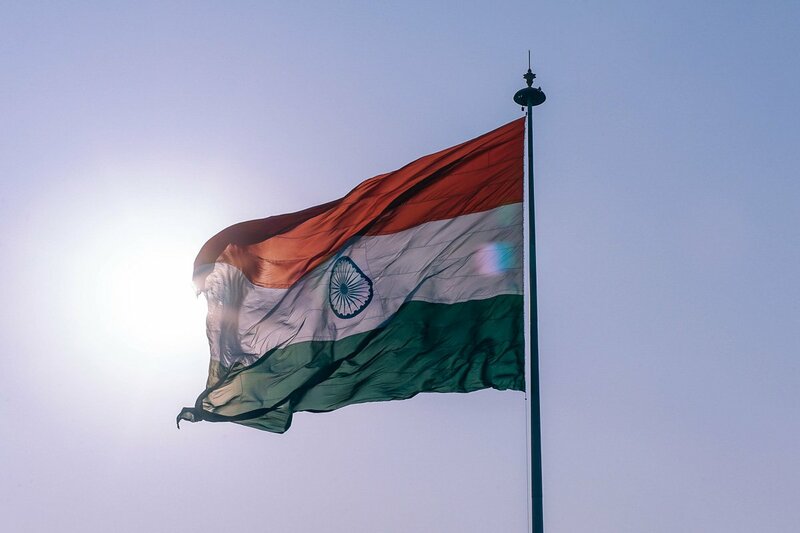 Among other places to visit in Amritsar is the well-known Wagah Border with Pakistan, at which an energetic and amusing flag-lowering ceremony takes place daily. Amritsar, unfortunately has a dark past, and is known historically for the massacre which occurred in 1919 when British troops opened fire on a group of protestors. The Jallianwalla Bagh, where the event occurred, remains one of the more important places to visit in Amritsar. Amritsar is without a doubt, home to some of the most delicious food we’ve had in India. Several dhabas around town dish up large portions of Punjabi delights which are difficult to resist. Kulchas and Amritsari lassis deserve a special mention, but more on that below! 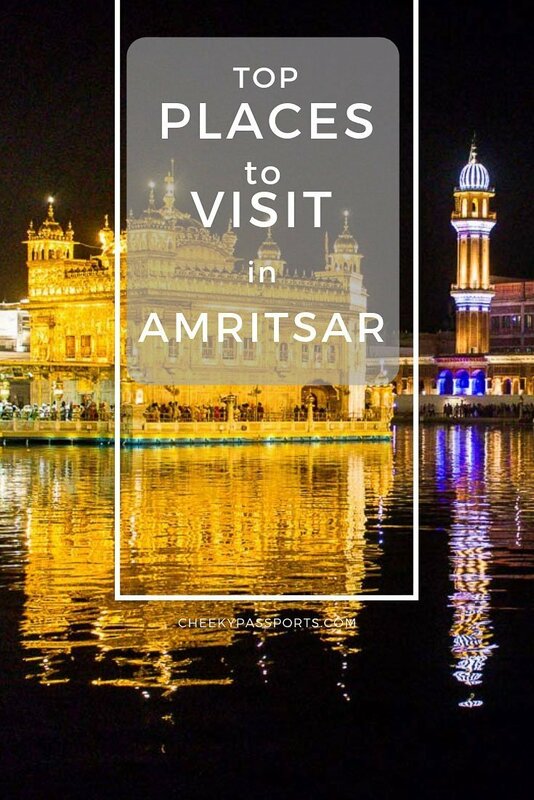 Here’s our list of top places to visit in Amritsar! Having trouble booking flights to the Amritsar? Choose Kiwi! 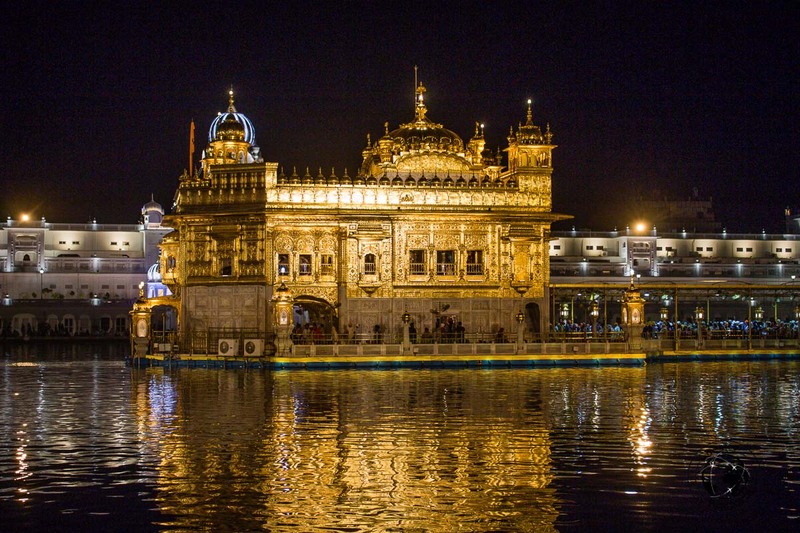 Besides the Golden Temple and the Wagah Border, there are several other places to visit and things to do in Amritsar. Follow this guide to learn more! 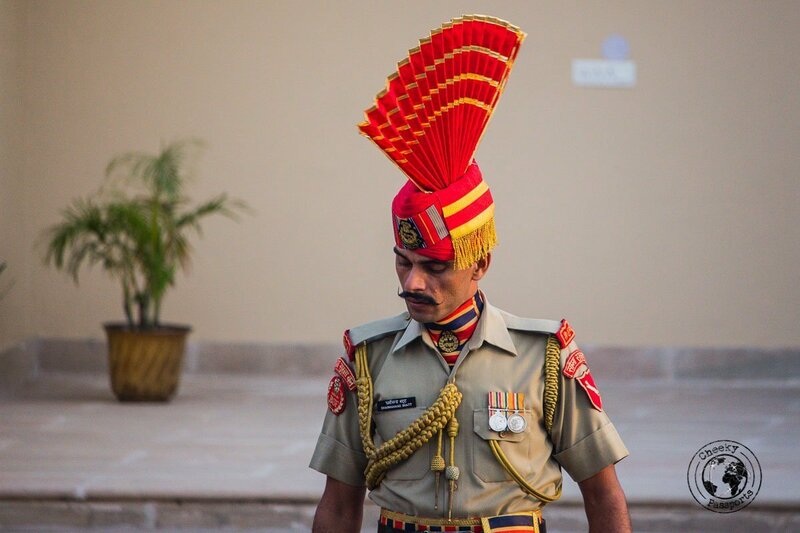 Attending the Wagah Border Parade was easily our favourite activity of the things to do in Amritsar. 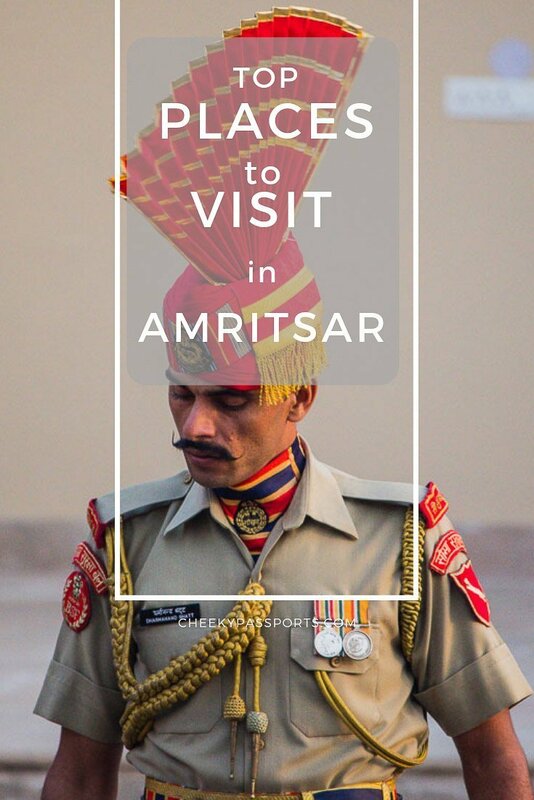 Getting from Amritsar to Wagah Border is easy, making the border very accessible and one of the most popular tourist places in Amritsar, so be prepared for crowds! 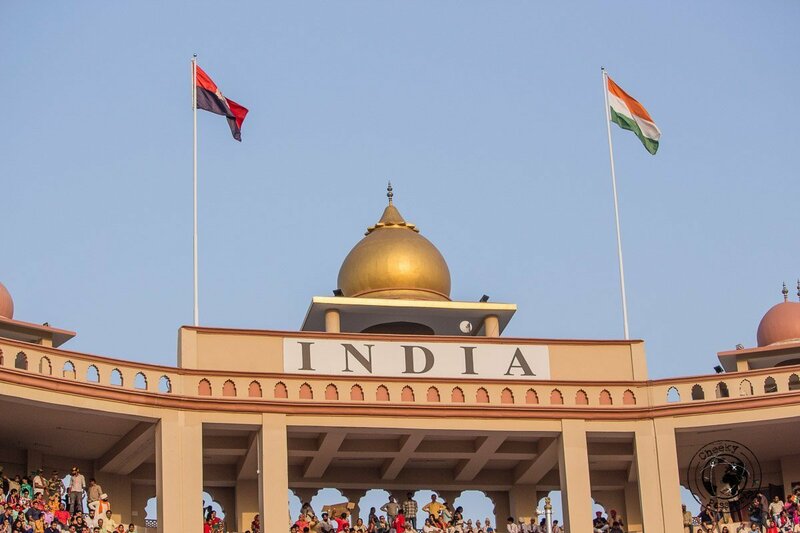 The Wagah Border Parade is also known as the Beating Retreat Ceremony, and its purpose is to formally close the border for the night and to lower the flags of India and Pakistan before sunset. What makes the Wagah Border Parade very entertaining is the foot-stomping and leg-lifting by both Indian and Pakistani soldiers, which have been synchronized so well, that they appear to be part of an orchestrated dance. 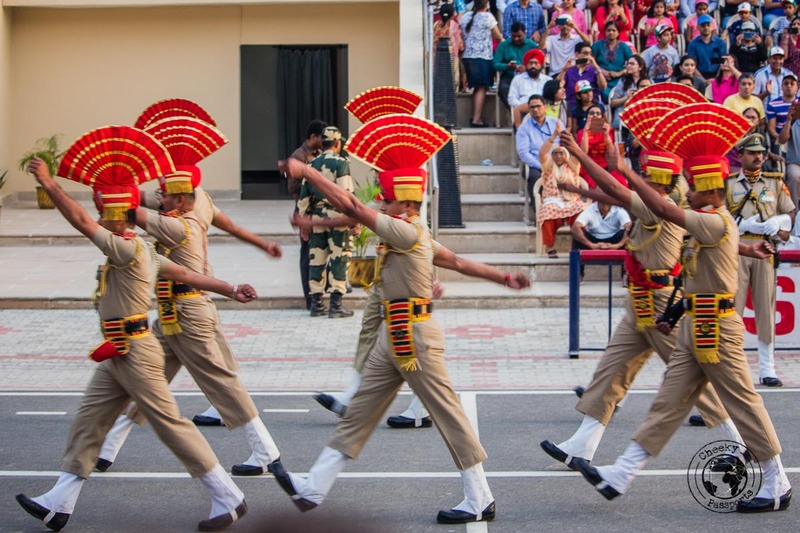 Wagah Border Parade timings differ according to the season so be sure to check about the correct timing during your stay. You can ask for the Wagah Border Parade timings at the stalls selling tickets from Amritsar to Wagah Border, located near the city square. We decided to go from Amritsar to Wagah border with the HoHo (Hop on Hop off) bus, but you can get a tuk tuk and ask the drive to wait for you as well. The HoHo bus tickets for the Wagah Border Parade cost Rs 250 each (about €3) for a return journey. Vendors were also selling tickets for a combined Wagah Border and city tour at Rs 350 (about €4.30). After purchasing the ticket, we were told to be at the stand near the city center at around 2.30pm. The journey from Amritsar to Wagah Border lasted about an hour. When we arrived there, we were joined by hordes of (mostly local) tourists all making their way to the border. The guide from the HoHo bus took us to a restaurant, but we were not interested in eating there and left to find seats at the parade ground. It is important to note that you need to show your passport to access the Wagah Border Parade, but you should really carry nothing else except water, a phone and a camera. Bags are not allowed (not even camera bags) and the officials are very strict about this, so do not even try to sneak one in – you will be stopped! Vendors also sell water and snacks to the audience, so you can easily purchase food and drink items whilst watching the Wagah Border Parade. There are separate queuing lines for foreigners and Indians; the foreigners line being typically shorter, so be sure to go the correct queue! 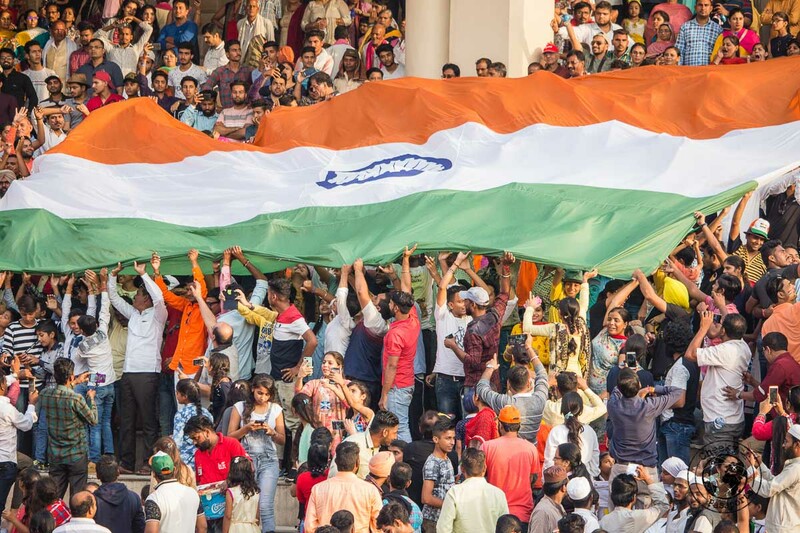 The Wagah Border Parade was preceded by lots of merriment from the Indians present in the audience (most of the audience was made up of very patriotic Indians), who carried flags and wore body paint depicting the colours of the Indian flag. There seemed to be different areas within the stands. The one closest to the border was reserved for VIPs who we understand were relatives of army officials, whilst a foreigners, mixed-gender stand was the next up. The Indians stand was divided by gender and located farthest away from the border, which we found to be rather odd, since the Wagah Border Parade is such a patriotic activity. 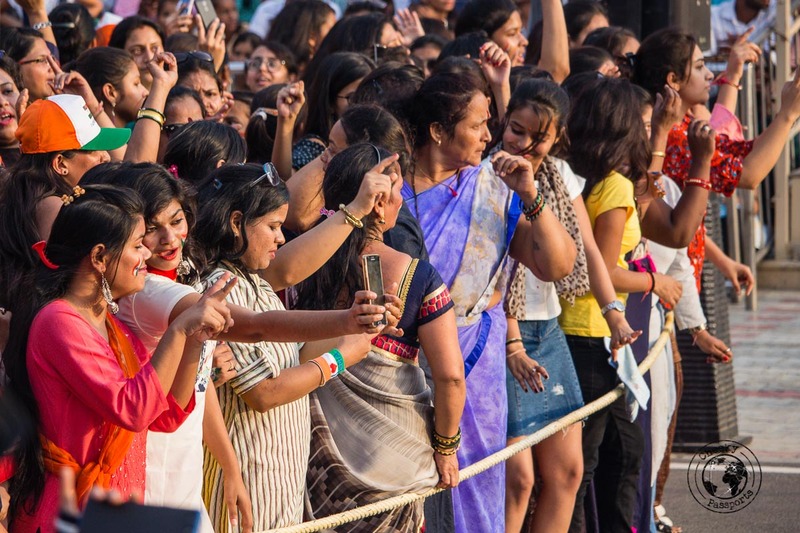 Loud music blared out from speakers and a group of women from the audience was allowed to enter the area and dance to Bollywood songs as the crowds cheered on. We could not see what was happening exactly on the Pakistani side, but music could also be heard, and dancing also seemed to be taking place. 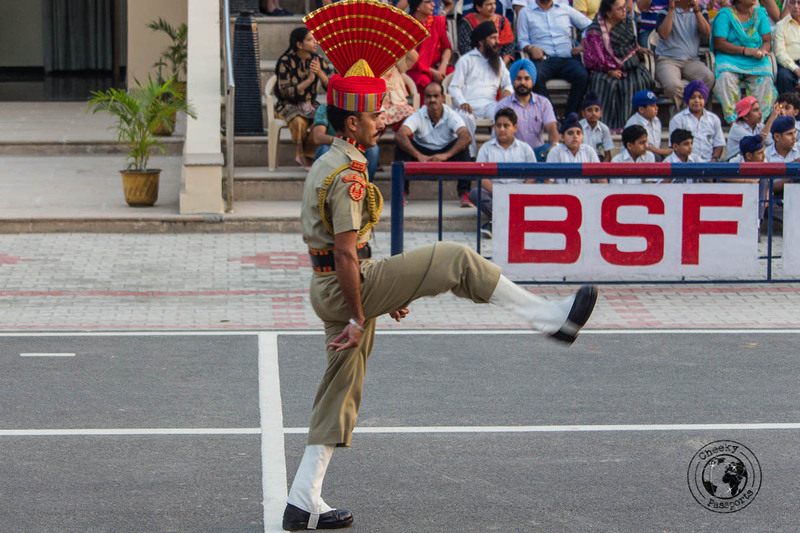 At 5.15pm, the Indian Border Security Force soldiers, dressed in khaki, started to descend into the ceremony area whilst the Pakistan Rangers, dressed in black were making the same synchronized steps on the other side of the border, and the ceremony formally started. The Wagah Border Parade is incredibly energetic with the soldiers raising their legs almost up to their foreheads. After the soldiers saluted one another, the flags were lowered, folded and taken away from the border by the respective marching soldiers. All in all, we found the Wagah Border Parade to be extremely unique and entertaining and should surely be included on any list of things to do in Amritsar! There’s no missing the huge temple complex when you’re in Amritsar, and you shouldn’t! Whether you’re Sikh, or religious at all, you will probably find the complex to be incredibly peaceful and tranquil despite the great number of patrons, and a lovely place in which to while away some time. The Sikh temple is one of the top places to visit in Amritsar for a reason. It is the most important shrine in Sikhism and is open to people from all walks of life. The complex houses a collection of buildings around a massive tank which visitors and worshippers can walk around, always in a clockwise direction. Some people bathe in the tank, whose waters are believed to have restorative powers. The Akal Takht is the building directly opposite the Golden Temple within the complex and is one of five takhts (seats of power) in Sikhism. The Golden Temple is also home to a massive kitchen, offering free langar food to people of all faiths, ethnicity, economic status and social standing. An estimated 60,000 to 80,000 pilgrims A DAY come to eat a meal for free. The meal is simple and eaten on the floor in a community setting – joining in was a great experience and one of our favourite things to do in Amritsar! The kitchen is run by a massive team of volunteers, but the pilgrims often make donations. The whole system of preparation, cooking, serving and washing utensils is highly organized and efficient. Most of the volunteers are Sikhs performing Seva (selfless service), work or service performed without any thought of reward or personal benefit. The food served is vegetarian, ensuring that all people can eat together here, as equals. It typically consists of daal, rice, roti, vegetables and kheer. Can you just begin to imagine the massive scale of this operation? About 5,000 kg of wheat, 1,800 kg of daal, 1,400 kg of rice, and 700 kg of milk are consumed daily in the langar kitchen. One hundred gas cylinders are needed to cook the food, which by the way is delicious! Entrance to the Golden Temple is free of charge. You need to enter barefoot but there are lockers at the side of the entrance which are also manned by volunteers who will keep your shoes. Storage is also free of charge. Volunteers are constantly pushing the water, which splashes on the walking area, to one side with massive squeegees so be sure not to stand in their way when you hear them coming! Private tours to the Wagah Border and Golden temple can be booked here. 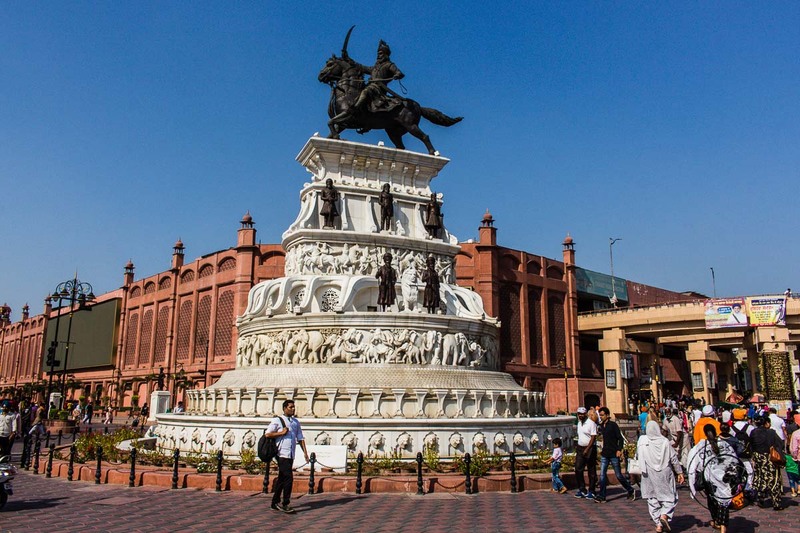 The Partition Museum is one of the top places to visit in Amritsar if you would like to learn about what shaped the division and creation of modern-day India and Pakistan. The museum gives a sometimes-painful insight into the time preceding and following the Partition, and highlights the difficulties and suffering caused by the Partition through people’s experiences. 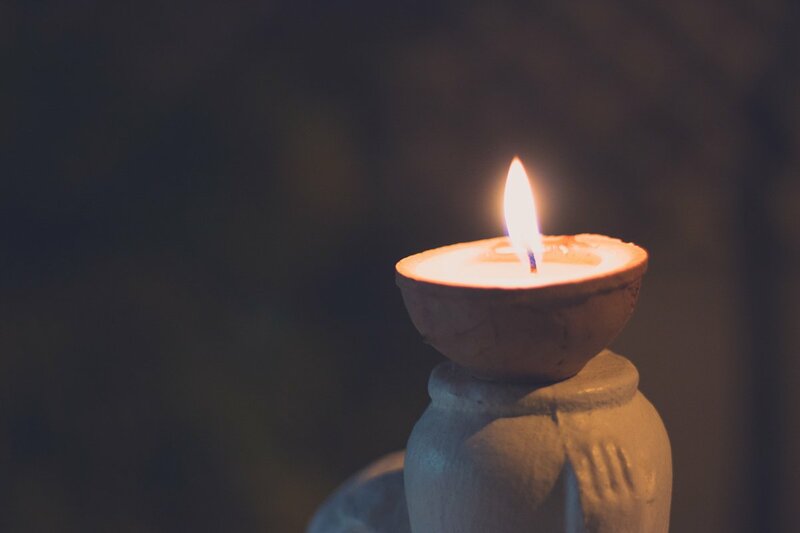 Be prepared to feel moved when visiting the Partition Museum, however do not underestimate its significance, if you are even just faintly interested in India’s history. The Partition Museum is located close to the Golden Temple. Photography is not allowed. 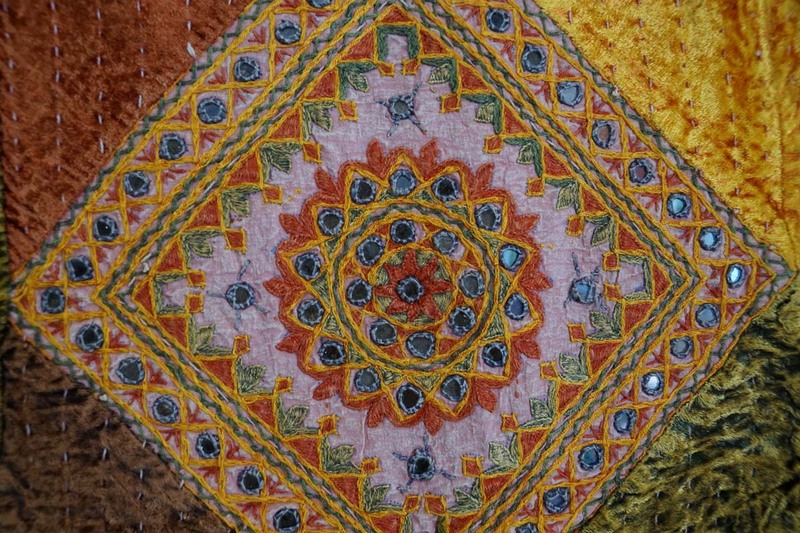 This large shopping complex is the one of the top places to visit in Amritsar if you’d like to get your hands on some gorgeous cloths, fabrics and handicrafts at competitive prices. Bargaining at some of the shops is possible especially if you intend buying a quantity of items from the same shop. Best place to get your souvenirs! The Hall Bazaar is located about 1km from the train station. This garden is the location of the horrific Amritsar Massacre of 1919 when British Army soldiers opened fire on a huge, unarmed gathering of people. The Jallianwala Bagh houses a well, which many people jumped into to save themselves from the shooting. Sections of the walls in the garden still show evidence of bullet marks. A memorial built to honour the massacre victims is also found within the well-maintained garden. The Jallianwallah Bargh is located close to the Golden Temple. The legendary dhabas of Amritsar are all about large portions of tasty Punjabi food in a local setting. Local dhabas are easily some of the best places to visit in Amritsar if you’re a foodie, or if you want to experience some of Punjab’s best dishes! There are plenty of dhabas in Amritsar, the most popular of which are Kaser Da Dhaba, Bharawan Da Dhaba and Brother’s Dhaba. Although they are often full, due to their popularity, we always managed to find a couple of spaces to sit down in, during our every visit. At times you will need to share tables with other guests. Despite the above dhabas being very popular, we also enjoyed Punjabi food at other local outlets in Amritsar. You will be hard pressed to find bad food in Amritsar, and we’re pretty sure of having put on a couple of kilos during our stay! Dhaba food is usually inexpensive so this meant that we could order a variety of dishes to try out. 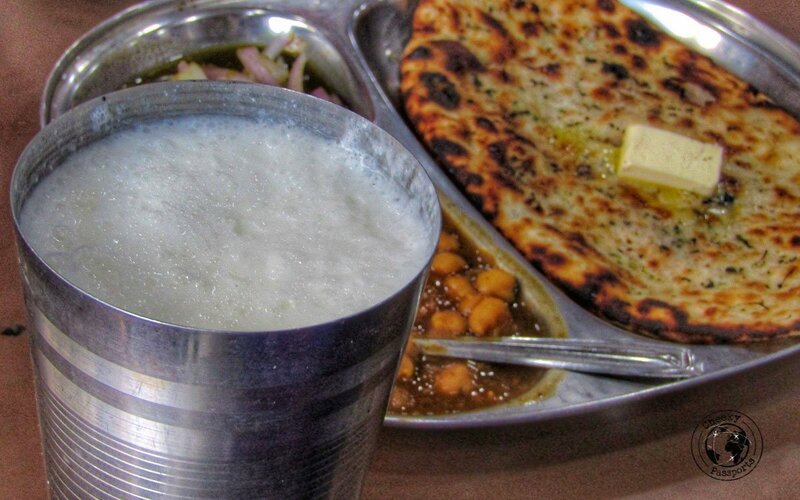 Be sure to put Amritsari Kulcha and lassi on your list of foods to try! You will not regret it! This 16th century temple, sometimes called the Silver Temple, is often considered to be a Hindu version of the Golden Temple, mostly because it is also surrounded by a water tank. The temple is dedicated to goddess Durga, with parts of it is also being dedicated to the Hindu deities Laxmi, The Goddess of Wealth and Narayan, The Preserver of the Universe. 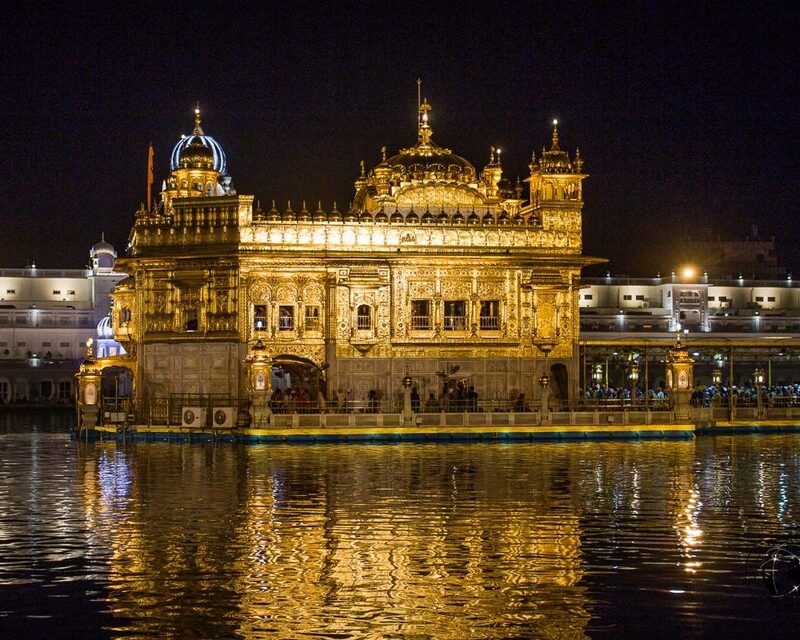 Certainly one of the top places to visit in Amritsar! Sri Durgiana temple is about 15 minutes’ walk away from the Golden Temple. This restored fort houses several buildings and museums, with many performances taking place here. It is best to go visit the fort in the afternoon/evening to watch the performances and the laser show. Gobindgarh Fort offers a different experience to other forts in India, with a bit of an amusement park vibe, which might not appeal to everybody. The fort is about 30 minutes’ walk away from the Golden Temple. Entry fee – Rs 100 entry for foreigners but various ticket combos available which include shows, rides and food. Harike Wetland is one of the most important wildlife sanctuaries in Punjab, home to several species of fish, turtles and mammals, amongst which are some endangered species. 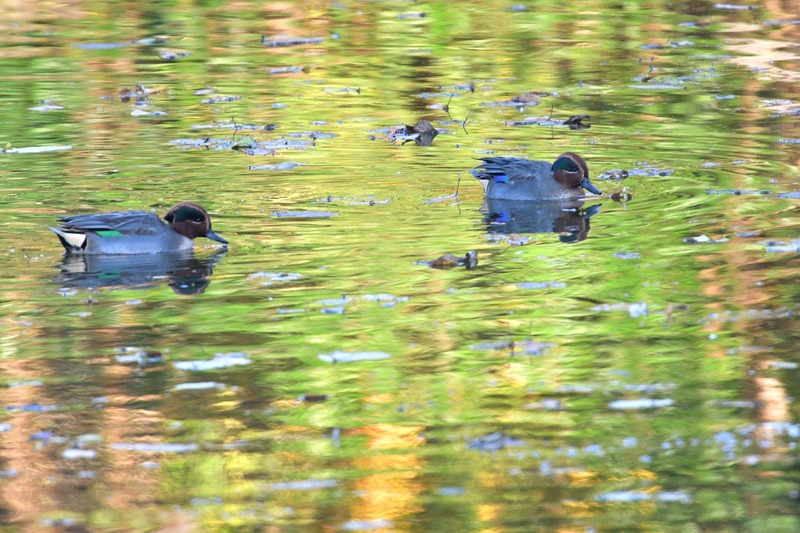 The wetland is about an hour’s drive away from Amritsar and several birds can be observed during the migratory season in the winter months. It is best to hire a cab for a full day trip to reach Harike. A permit from the forest officer near the sanctuary (which needs to be shown at various checkpoints) has to be obtained before visiting. 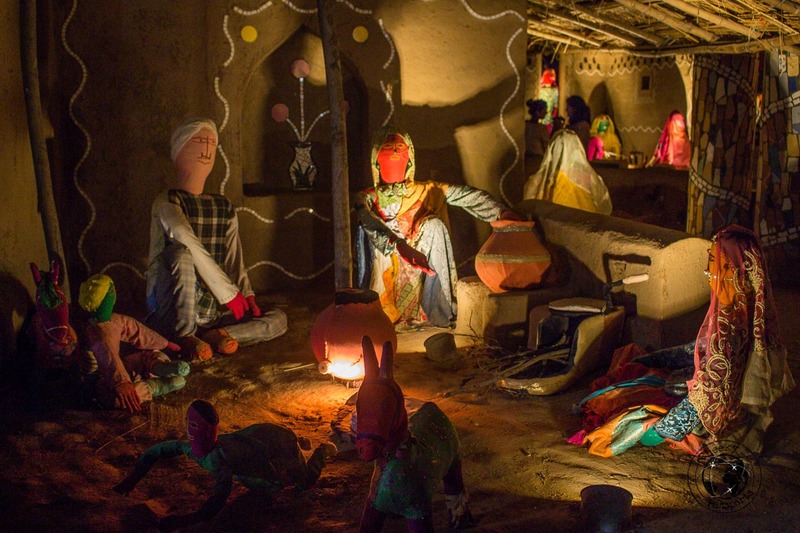 This very quirky attraction is located in Chandigarh, about four hours’ drive away from Amritsar, and is easily one of the places we enjoyed most in Punjab. The garden is filled with sculptures built entirely from industrial scraps and waste material. 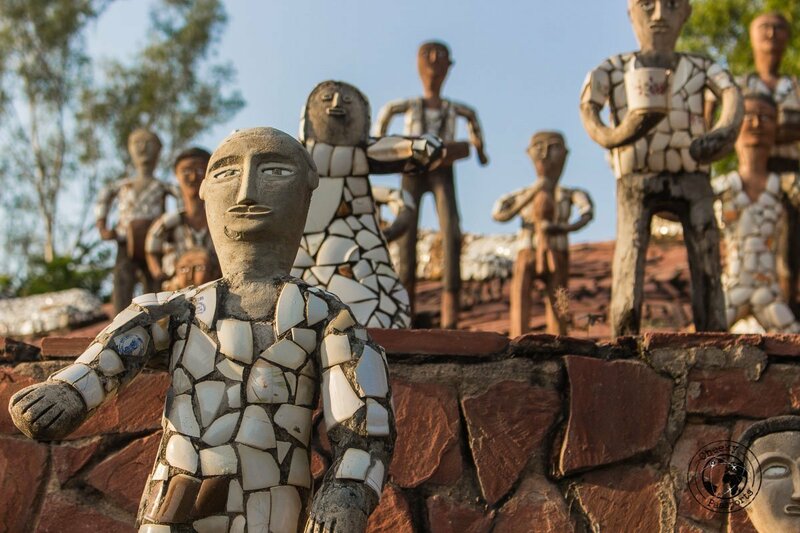 The garden was started secretly and illegally by Nek Chand, a government official, but it was only discovered by authorities 18 years after he first started building it, and it was decided to preserve and inaugurate it, and eventually to also expand it! The same artist also made fantastic dolls and props from rags showing life in India which are now displayed in a museum in the rock garden. Ten points for creativity! It is easy to reach Chandigarh from Amritsar via train or bus. Buses can be booked on 12Go Asia, whilst trains need to be booked via the IRCTC website. There are several budget hotels located directly opposite the bus station, and if you are not a light sleeper, they are very convenient. The hotels are located about 15 minutes’ walk away from the Golden Temple and other tourist places in Amritsar. We stayed at Platinum Inn and Suits (one of the hotels opposite the bus station), which seemed to be undergoing refurbishment during our time there (we managed to get a discount because of this). Every day, a different part of the hotel seemed to have been demolished (! ), but we were rarely inconvenienced. As mentioned above, dhabas and local eateries are the best places to eat in Amritsar; the local food is some of the best you’ll taste in India! If you are not partial to local food, international joints such as Subway, Domino’s and McDonalds are located close to the Golden Temple, but we avoided these like the plague! If instead you are craving some grilled food, Barbecue Nation (a local chain), offers a menu of either veg or non-veg, all-you-can-eat buffet in a more upscale setting. The starters include all you can eat veg or non-veg skewers. Though more expensive than dhaba food, we really enjoyed our experience there! 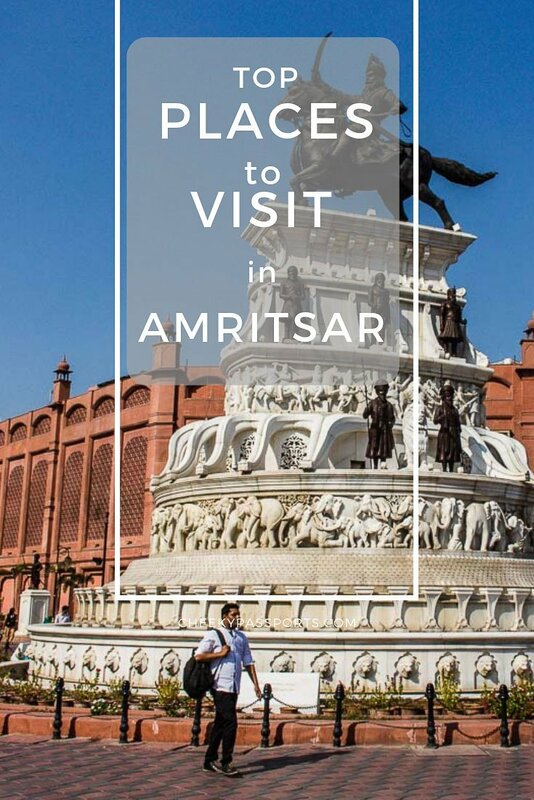 We hope to have shown you that with so many places to visit in Amritsar, the city is surely worth putting on your India bucket list! 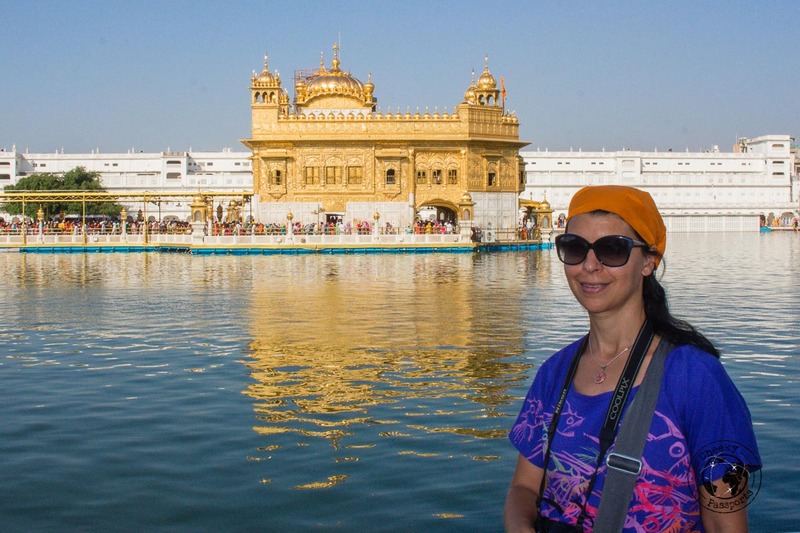 We are all about independent travel, but if you prefer guided tours, you can choose from a range of tours around Amritsar here.